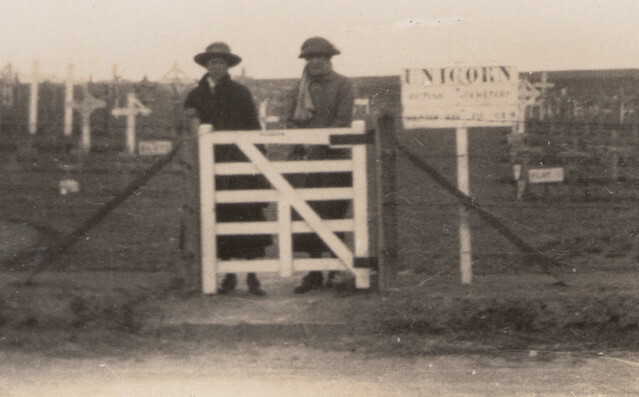 Unicorn Cemetery close to the village of Vendhuile is on the Hindenburg Line battlefields which saw fighting in 1917/18. It gets its name as some original burials were made by the burial officer of the 50th (Northumbrian) Division whose insignia was the head of a Unicorn. It contains the graves of nearly 600 British and Commonwealth casualties of the Great War who fell here in the last two years of the war. This photograph shows the family of one of these casualties visiting the cemetery in the early 1920s. The cemetery has not been made permanant and a wooden signboard bears the cemetery name and map reference. The plots have already been laid out and a little fence placed round with a gate; at the time this image was taken, the decisions about how to make these cemeteries permanant were in fact still being made. Who these early battlefield pilgrims were is sadly not noted on the photograph; it would appear perhaps to be a sister on the left and mother on the right – perhaps father took the photograph? Given the cost and difficulty in getting to these places at that time for many families like this it was a once in a lifetime visit; that this photograph was special to those in it is clear from the fact that it remains mint; well hidden and well stored for decades until I found it in a Sussex junk shop in the 1980s. This entry was posted on 29/01/2012 by sommecourt. It was filed under France, Great War, Hindenburg Line, War Cemetery, Western Front, WW1 and was tagged with 1917, 1918, Great War, Hindenburg Line, Pilgrimage, War Cemetery, Wargraves, WW1. I have a photograph of my great grandmother, Clara Elizabeth Braley visiting the grave of her son Sapper Frank Braley who was KIA on 20th Nov 1917 at Bullecourt in the action to take the tunnel trench. When she visited the cemetery in St Leger, in 1928, the tombstones were in place but the engraving had not been done. Frank is buried in Row G grave 5, but she was told he was in Row G Grave 15 – she travelled all that way from Liverpool only to visit the wrong grave as her son lay maybe three metres away. Only a small thing, but how tragic? Another belter here Paul – I have passed close to here many times, but never had the opportunity to visit – and what a tragic story from Judith. My goodness, did Clara ever find out about her mistake I wonder? Our family is so richly enmeshed with the British Empire and public service. While I am appalled with the terrible loss of life in WW1 and 2, I am also really grateful for those who gave their lives with a heart and passion for the public domain and good. Our emerging generation has new horizons to manage. But we must be vigilant about living with grace, mercy and peacefully.